Quality for Business. Quality for Life. Located just 90 minutes from Chicagoland, the cities and counties of North Central Illinois offer a special environment for residents, workers, students, and families. With a population of 154,000, the region is known for strong leadership, business support, safe neighborhoods, quality development, economic diversity, good schools, family oriented lifestyle, and sound real estate investments. Great Air Quality - Entire North Central Illinois Region is EPA Attainment. Relax and Have Fun. Residents have discovered an unequaled and affordable quality of life, making this region an exceptional place to live, work, and play. North Central Illinois offers the best of both worlds, with a relaxing rural environment, plus easy access to urban amenities, and varied entertainment options in one of the world’s greatest metropolitan areas. Popular state parks, rivers, waterfalls, hiking and biking trails, tree-lined neighborhoods, historic districts, city parks, active downtowns, and friendly people are hallmarks of this area. 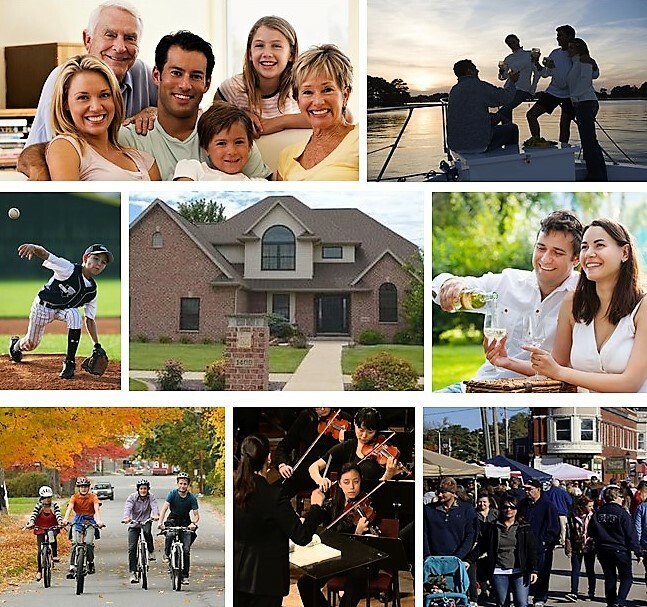 Exemplary blue-ribbon schools, parks and recreation programs, area lakes, boating and fishing opportunities, and popular golf courses add to the quality lifestyle. Shop and Dine. Shoppers will love the variety provided from unique downtown businesses, regional shopping centers, and hundreds of retail and service companies. Cultural and entertainment activities are diverse, in a region where fine dining options are matched by craft brewpubs and hometown taverns. Area diners enjoy hundreds of popular restaurants featuring great steaks, seafood, and cuisine ranging from Italian to Cajun. North Central Illinois residents have affordable housing options, ranging from cozy bungalows to expansive residential subdivisions. Six outstanding hospitals offer exceptional and modern health care services. Enjoy Life. North Central Illinois citizens take advantage of the locally based Illinois Valley Symphony, theatrical productions, unique hometown Festivals, County Fairs, exciting events, touring productions, and popular musical entertainment, as well as LaSalle Speedway, nearby casinos, Chicago land NASCAR speedway, and horse-racing. Sports enthusiasts take advantage of one of the Top Sports Regions in the world where Chicago boasts Championship National League teams in Baseball, Football, Basketball, Hockey, and Soccer. Regional Minor league hockey and baseball teams, outstanding Division 1 College sports programs, plus state-ranked high school teams provide never-ending opportunities for action and fun. Residents enjoy the fun and excitement of hundreds of area events including: Burgoo Festival, Two Rivers Wine Festival, Festival 56 Professional Theatre Festival, RiverFest, Engle Lane Theatre, Stage 212, Pluto Fest, 4th of July Spectaculars, Sweet Corn Festival, Homestead Festival, Jazz N the Street, BBQ N Blues, and the year-round Starved Rock Concert Series. Historical attractions include the 1863 Red Covered Bridge, Museums, the I&M Canal Boat Excursions, Hegeler Carus Mansion, and Reddick Mansion. The nearby Metro Chicago region is considered one of the best arts and entertainment regions in the world, with the Art Institute (recently named the world's best museum), Chicago Symphony Orchestra, Lyric Opera, Broadway in Chicago, Lincoln Park Zoo, Chicago Botanic Gardens, acclaimed galleries, Goodman Theatre, Steppenwolf, Victory Gardens, and hundreds of other regional theatres. This is where "great family lifestyles" are special because of Quality Communities, Low Crime, Low Cost of Living, Outstanding Leaders, and Productive Schools. Quality for Business. Quality for Families. Turn your business expansion plans into more profits in North Central Illinois. Please contact us at (815) 224-0645 for more information.